Tauy Creek: POB #7: Riddle, Riddle, Who's Got the Riddle? In some alternate universe, millions of people every week are watching the hit CW show "Westfield" but we don't live in that alternate universe, we live in the universe where Archie Andrews reigns supreme as the THE teenage comic book star. 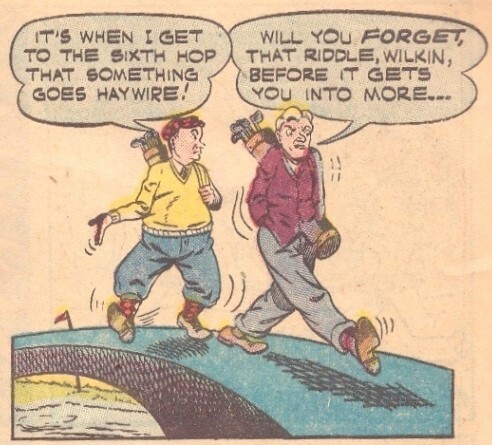 Debuting three months before Archie did, Wilbur Wilkin came on the scene in Zip Comics #18. 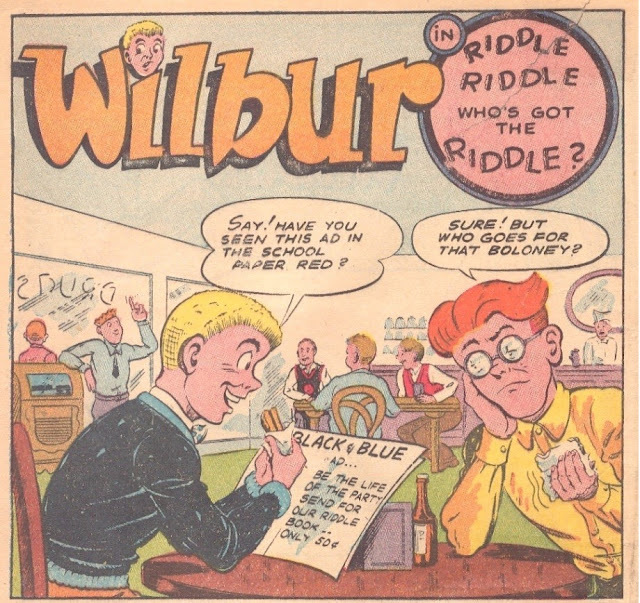 Wilbur obtained his own series in 1944 which lasted until 1959. It managed to crank out three more issues in 1963, 1964, and 1965, finally coming to an end in with #90. 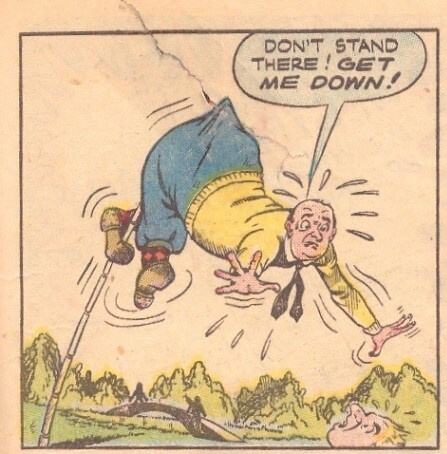 Wilbur has been occassionally reprinted in various Archie Comic Digests but it seems as if Wilbur's short-lived time in the sun is over. 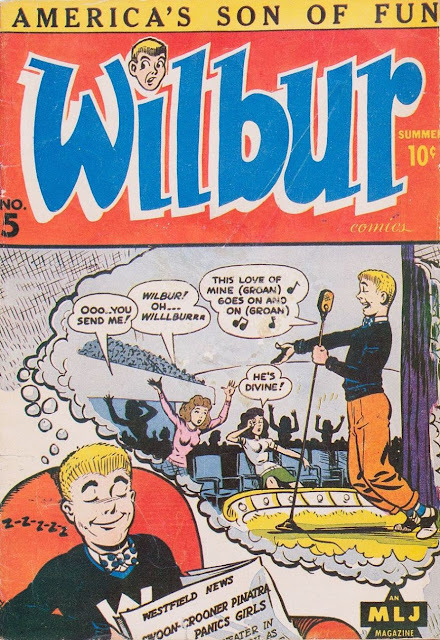 Archie Comics would recycle the Wilkin name in the ongoing series That Wilkin Boy in 1962. Whether this was an attempt to update Wilbur Wilkins for the 60s is unknown. Zip Comics would be canceled in 1944 after 47 issues. In Wilbur's first appearance, he beats up someone who calls him Willie instead of Bill then is proven right when his father berates a man for calling him Mr. WilkinS. The story then goes off on a tangent of Wilbur putting together a football team to impress a man he thinks is a recruiter but is really just a cheerleader. I honestly think the reason Wilbur didn't hit it big with America is because of the hair. 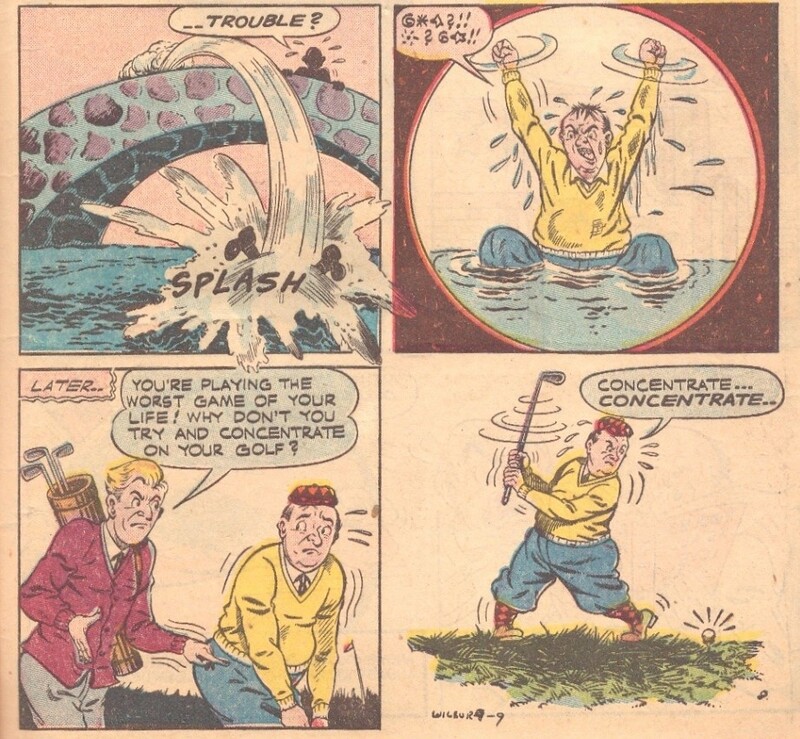 I've often wondered, is it against some sort of law to use a famous person's name in a fake headline on a comic book? Pinatra is clearly Sinatra but why couldn't they just put Sinatra? Was Frank going to sue if he saw his name attached to this? Would people think using Sinatra on the cover would be an endorsement from him? What boloney? The boloney in the school paper? The ads should just be local businesses, what local business is selling this riddle book? Also, my spell check says "boloney" is spelled wrong. 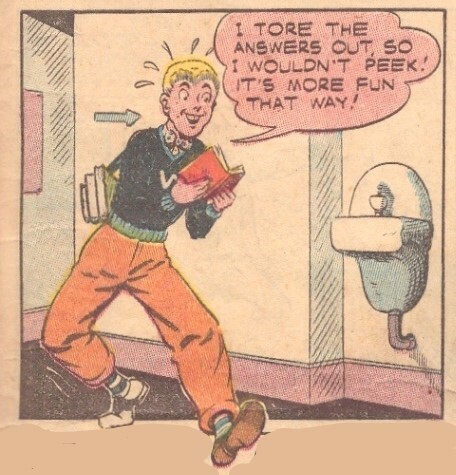 What fun? It's just a book of riddles. No one likes riddles. Now if it was a book of practical jokes then I'd be onboard but riddles? You're just wasting fifty cents, Wilbur. "Yes! Yes!! Now I can spite my enemies with riddle after riddle! HAHAHAhaHahahahHAHAahaaha!!! The streets will flow with the blood of the unfunny!" 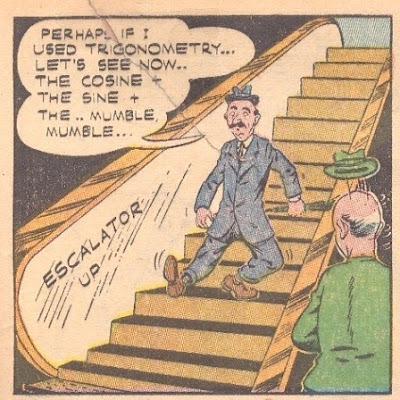 Is it, Wilbur? Is it? 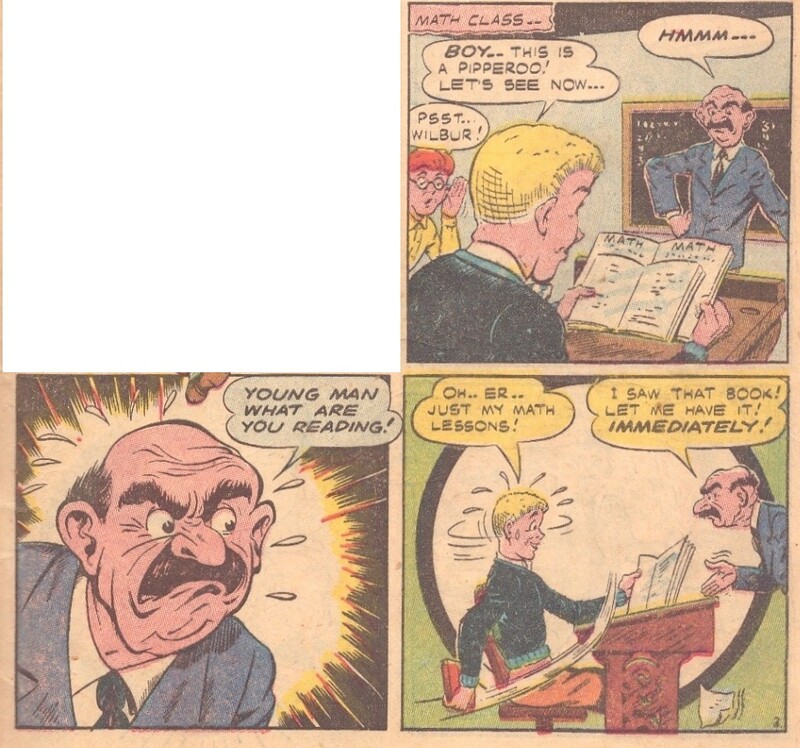 That's quite the face on the math teacher. It's like his face is melting and he's trying to use all his muscles to keep it from melting. It's not working. That's an odd punishment and something that I don't think would really hold up. That teacher better be careful. We're in the part of history where random people on the street could have some committed to an asylum. Do you know the answer to this riddle? How can 5 apples be divided among 4 girls and 2 boys so that the boys get twice as much as the girls? Seems like a very wordy riddle. Also sexist. 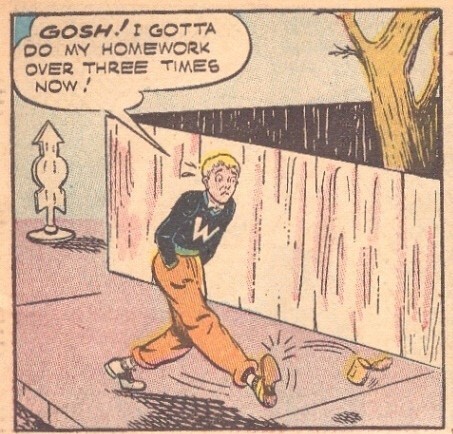 They seem to be spending a lot of comic panels on this math teacher. Too many if you ask me. Now, you might think that this isn't a news story that would show up in a newspaper but I am looked at old newspapers a lot lately and can confirm random hospitalizations were very common stories back then. Heck, people just visiting people across the county sometimes made the paper. Two grasshoppers start out in a race 25 feet apart. With every hop, the hopper who's behind cuts the lead in half. In how many hops will he catch up? 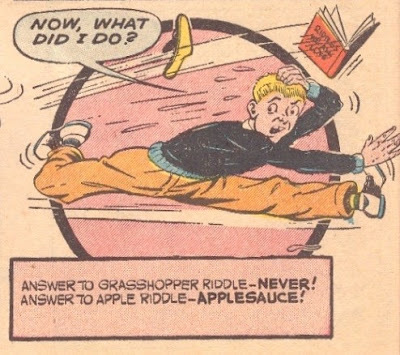 Again, that riddle seems really wordy. Can no one in this universe keep their thoughts in their head? I guess if they actually just thought their thoughts, then Bill Vigoda wouldn't have an excuse to draw these rubbery confused faces. The bus doesn't turn around and take the route in the other direction? That's some terrible mass transit. 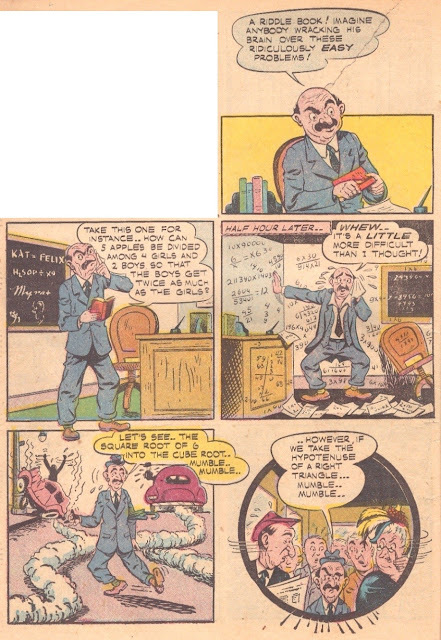 I think now is a good time to point out that 1)Mr. Wilkin wasn't mumbling; and 2)the artist, Bill Vigoda, was the brother of Barney Miller actor and possible deceased person, Abe Vigoda. 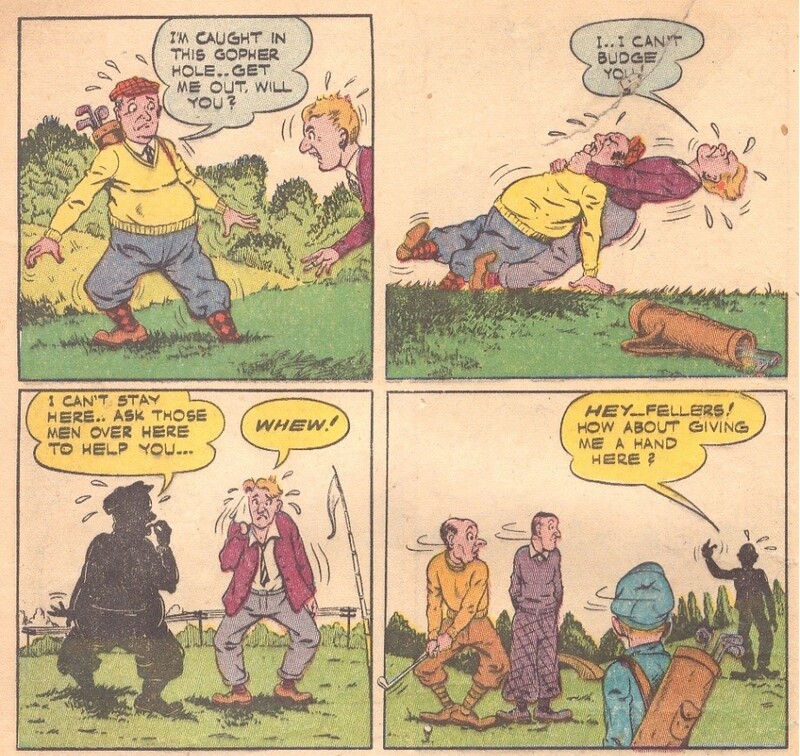 Vigoda continued to hone his artistic skills into some many Archie stories and was the person who did the art for Li'l Jinx. Vigoda would pass away in 1973. I thought Wilbur was supposed to be in this story. 37 panels in, only 11 have Wilbur. It took four men to get another man's foot out of a gopher hole? I get that this is a comic book but that is the most unbelievable thing I've ever seen in a comic. What? How...? What...? Huh...? 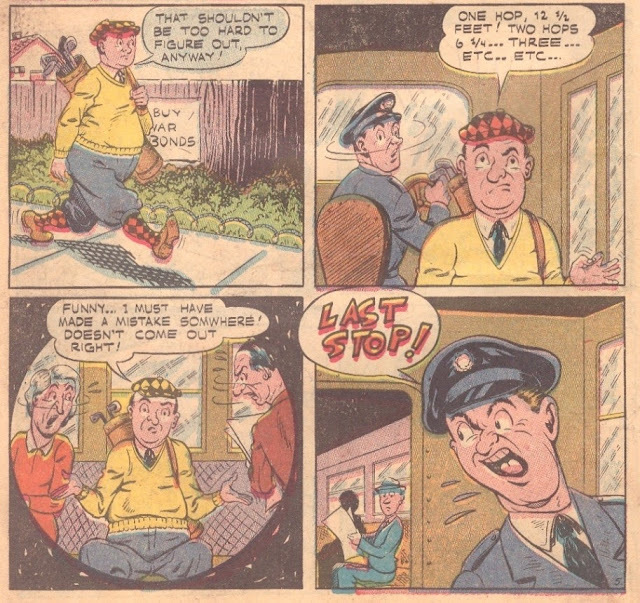 This is now the most unbelievable thing I've ever seen in a comic. You know the best thing about this story? The answers to the riddles are probably very underwhelming. I'm not a golfer and I have never met someone who is and I've spent very little time on golf courses but why is that bridge like that? It's too high up, no guard rails, and any idiot could easily just walk off of it. Any idiot just did! Oh, good. Mr. Wilkin's breakdown made the evening edition of the local paper. There you have it. The answers to the riddles and I want to do the same thing to Wilbur or at least the creators of this story--if they weren't both dead. Let's recap. How can 5 apples be divided among 4 girls and 2 boys so that the boys get twice as much as the girls? Applesauce. Two grasshoppers start out in a race 25 feet apart. With every hop, the hopper who's behind cuts the lead in half. In how many hops will he catch up? Never. This could really use some explanation. If you make applesauce then you are not dividing up apples are you? And we need clarification on the grasshopper one. Wilbur deserves to be bludgeoned by that riddle book. 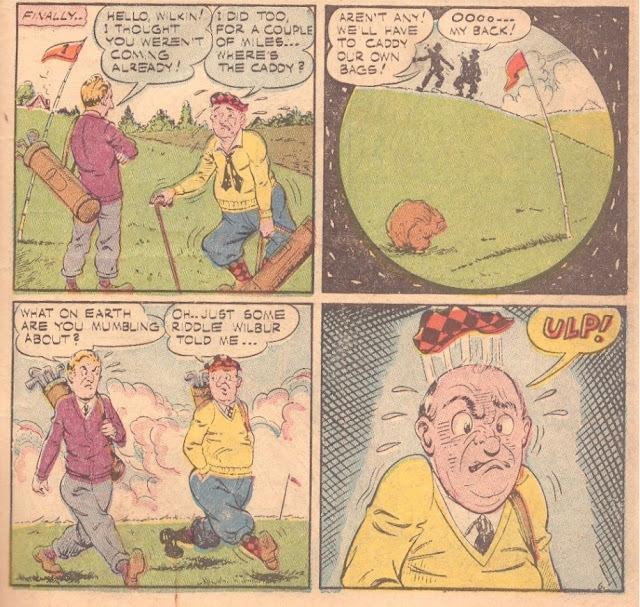 Wilbur should've heeded Red's warning.